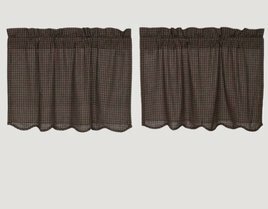 Bring the romantic scalloped edge of the Kettle Grove Plaid Prairie Short Panels to your Country home.. The rich colors of black & beige in a micro check design. Panels are lined & sold as a set. Each panel measure 84" L x 40" W. Includes set of tiebacks. 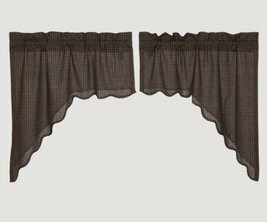 Bring a primitive touch to your home wit the Kettle Grove Block Border Valance. The rich colors of pointed black and tan check over solid tan. 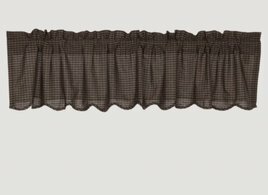 Valance is lined and measures 16" x 72". 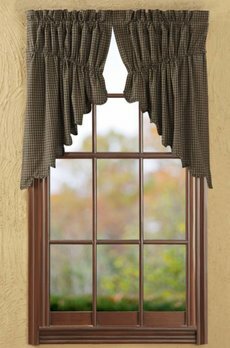 You'll love the rich colors of the Kettle Grove Plaid Layered Valance for your Country home. 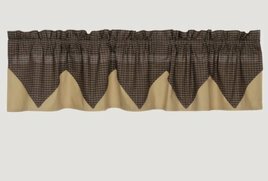 It has a double layer with Pointed black and tan check over solid tan.. Each panel measure16" x 72". Give your Primitive home a romantic touch with the scalloped edge of the Kettle Grove Plaid Scalloped Swag. The rich colors of black & beige in a micro check design. Panels are lined & sold as a set. Measures 36"x36"x16". The romantic scalloped edge of the Kettle Grove Plaid Prairie Swag brings a finishing touch to your Farmhouse home.. The rich colors of black & beige in a micro check design. Panels are lined & sold as a set. Measures 36" x 36" x 18". 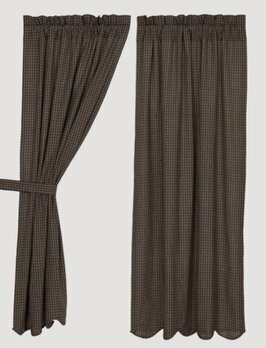 Bring the rich colors of the Kettle Grove Plaid Short Panel Scalloped Set to your Primitive home.. You'll love the black & beige in the micro check design. Panels are lined & sold as a set of 2. Each panel measure 84" L x 40" W. Includes set of tiebacks. Bring the rich colors of the Kettle Grove Country Panels to your Primitive Country home.. You'll love the black & beige in the micro check design. Panels are lined & sold as a set of 2. Each panel measure 84" L x 40" W. Includes set of tiebacks. 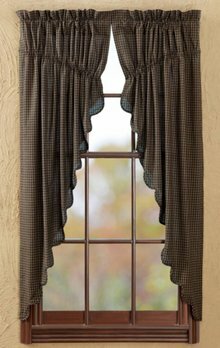 Complete your window with the Kettle Grove Plaid Balloon Valance. 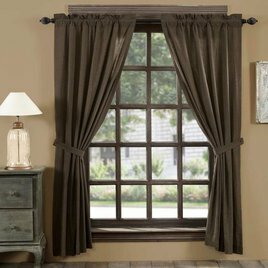 This valance is perfect in any country farmhouse or primitive home. Made of 100% Cotton, lined with white cotton. Measures 60" W with a 15" drop, a 3.25" rod pocket and a 2" header.